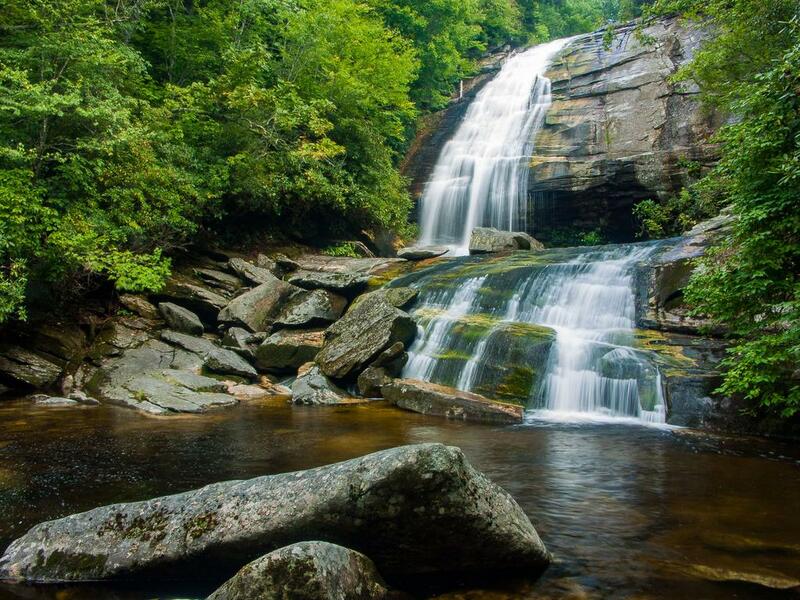 Greenland Creek Falls is a beauty worth visiting. A steep cascade drops over a ledge onto an outcrop among boulders before shifting right, and dropping over another, smaller, cascade into a deep and wide pool. Large lichen-covered boulders surround the falls. The rocks under the running water are colorful (including green with algae and moss). The water is clear, yet naturally tea-colored - stained by leaves steeping in slow-moving tributaries and boggy areas upstream. From downtown Brevard, NC, take US 64 West for about 15 miles (it becomes very curvy) to the intersection with NC Hwy. 281; turn right. Go 0.8 miles and turn left on Cold Mountain Road (the fire station is on the right). Proceed just under 6 miles up Cold Mountain Road; the road turns to gravel. At a sharp left turn, a sign will indicate the Panthertown parking is just ahead. It is 0.1 mi. from the sharp left turn to another gravel road on the right signed for the parking area. This road is about 0.1 mi. long and the parking area is just a wide spot at the end of the road. From the parking spot, walk back down the road and take the Mac's Gap trail on the right. This will switchback to the right and begin downhill on an old road bed. After 0.6 mi, you'll reach an intersection with the Greenland Creek trail - bear left and reach another intersection in 0.1 mi. The main trail (Mac's Gap) curves right on the old road bed, going across the creek. Turn left to stay on the Greenland Creek trail. This narrow footpath winds and twists its way gently uphill to the base of the falls in another 0.3 mi. The last little bit is a scramble over some boulders and through rhododendron and mountain laurels to the base of the falls.